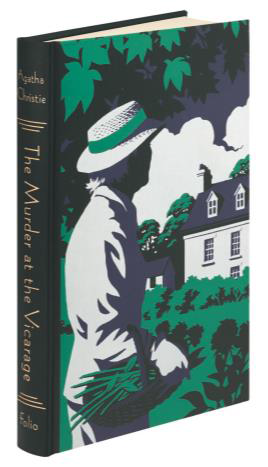 The Folio Society is publishing a special four-volume edition of Agatha Christie’s Miss Marple novels, featuring The Murder at the Vicarage, The Body in the Library, A Pocket Full of Rye and Sleeping Murder. Born in 1890, Agatha Christie wrote 80 crime novels and short-story collections, 2 autobiographies and 8 novels under the pen name Mary Westmacott. 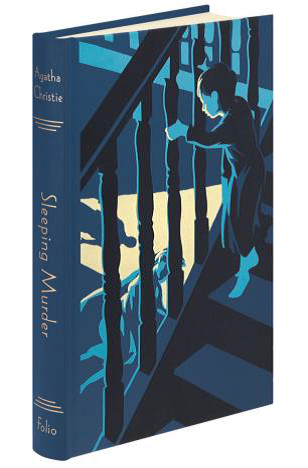 Sales of Christie’s books exceed 2 billion worldwide – only Shakespeare and the Bible outsell her – confirming that, over 120 years since her birth, she retains her position as the grand dame of crime fiction. In a newly commissioned introduction, award-winning author and Christie biographer Laura Thompson explores the life experiences that inspired Christie to create Miss Marple, the ‘deceptive simplicity’ of the novels and their shrewd grasp of human nature. Andrew Davidson’s beautiful, nostalgic images use unusual angles and perspectives to add suspense. 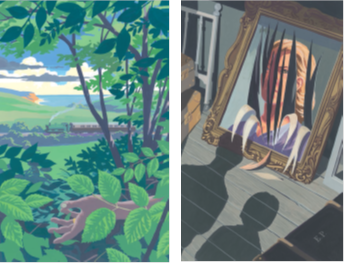 The illustrations he has created for this new 4-volume set follow on from the evocative artwork in The Folio Society’s single-volume edition of the Miss Marple Short Stories. To say that Colonel Protheroe is not popular in the village of St Mary Mead would be an understatement. Even the mild-mannered vicar has been heard to remark that anyone who murdered him ‘would be doing the world at large a service’. Shortly afterwards, Protheroe is found shot dead in the vicarage study. From the Colonel’s faithless wife to the vicar himself, everyone in the village seems to have had a motive to kill the Colonel, but who actually fired the gun? The unlikeliest of sleuths comes forward in the shape of Miss Jane Marple. Murder at the Vicarage is the first ever mystery to feature Miss Marple. 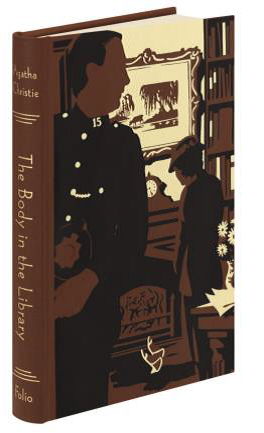 Agatha Christie spent years devising this novel with its ingenious variation on the now-familiar theme of the body in the library. She laid down certain conditions for herself: the library must be a highly orthodox and conventional library, while the body must be a ‘wildly improbable and highly sensational body’. When Mrs Bantry tells her husband that the maid has discovered the body of a beautiful, blonde young woman in their library, his reply is, ‘Nonsense, old girl; you’ve been dreaming.’ But it is no dream, and Mrs Bantry has no choice but to call upon her friend Miss Marple to discover who committed the murder, before they strike again. Mr Rex Fortescue appears to have everything: a booming financial empire, a glamorous secretary and an even more glamorous wife – until one day, he drops dead over his morning tea. Inspector Neele, called to investigate, is puzzled to find that the dead man’s pockets contained cereal grains – in other words, he died with a pocket full of rye. When one of Fortescue’s servants is found dead with a clothes-peg on her nose, Miss Marple is compelled to point out to the Inspector that they may be dealing with a case of murder by rhyme. 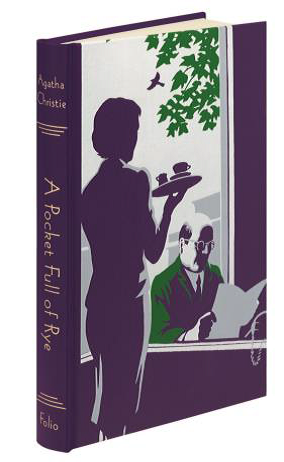 Filled with twists and turns, A Pocket Full of Rye is a virtuous display by Christie. Gwenda and Giles Reed, a young married couple, have emigrated from New Zealand to England. Gwenda is delighted with her new house in a seaside Devon resort – until a sequence of sinister events begins. Gwenda knows details about the house that she could not possibly know – and she feels a mysterious terror every time she climbs the stairs. In her attempt to discover the truth, she calls in Miss Marple, who helps her uncover a ‘perfect’ crime committed years before. Agatha Christie wrote Sleeping Murder, the final Miss Marple novel, while living in London during the Blitz, but held it back for publication until after her death in 1976. Miss Marple’s last case is the ideal end to a brilliant career. For over 65 years The Folio Society has been publishing beautiful illustrated editions of the world's greatest books. We believe that the literary content of a book should be matched by its physical form. With specially commissioned illustrations, many of our editions are further enhanced with introductions written by leading figures in their fields: novelists, journalists, academics, scientists and artists. There are hundreds of Folio Society editions currently in print covering fiction, biography, history, science, philosophy, children's literature, humour, myths and legends and more. Exceptional in content and craftsmanship and maintaining the very highest standards of fine book production, Folio Society editions are created to last for generations. Folio Society titles can now be bought as a single book purchase from www.foliosociety.com, by telephone on 0207 400 4200 or by visiting The Folio Society Bookshop, 44 Eagle Street, London, WC1R 4FS. Such a shame A MURDER IS ANNOUNCED is not included. I think it's the best plotted Marple novel, stems from an original idea, has varied and intriguing characters. It's quintessential Christie. Too bad the editors failed to see that.